Visiting new places, finding the mysteries and being a living example of touching the truth about various places is incredible. Himalayan trekking gives you a lifetime experience as it involves high mountains, rivers, valleys, forest and many such breathtaking views. It is enriched with the natural beauty which you can explore to a vast extend, as the experience is never ending. Uttarakhand is such place where people around the world visit to trek and gain a lifetime and unforgettable experience. First of all, let us know the origin of the name of Brahmatal Lake. According to the Hindu Mythology, this is a lake where Lord Brahma meditated; therefore the lake was named as Brahma Tal. 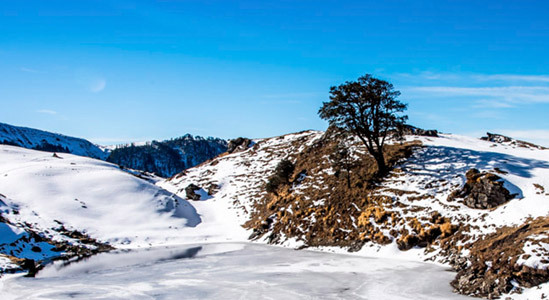 The Brahmatal trek is at an altitude of 12,100 Ft. with approximate trekking of 22 kms. The best time to visit and explore Brahmatal is springs and winters. You pass through the exotic and stunning landscape like oak forest, snow fields and rhododendron. 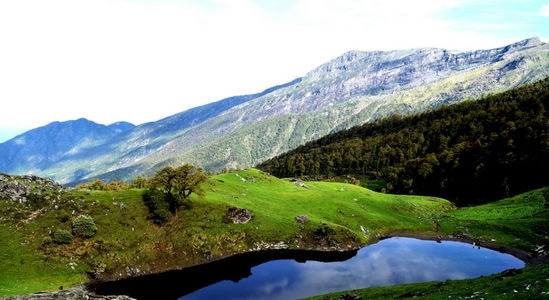 The majestic views of the nature, teases you to visit Brahmatal Trek and capture the natural beauty. According to our mythology, Lord Brahma, who is the lord of creation did meditation for many years in this place and therefore this place is known as Brahma Tal today which is one of the basic knowledge to have about this Tal. 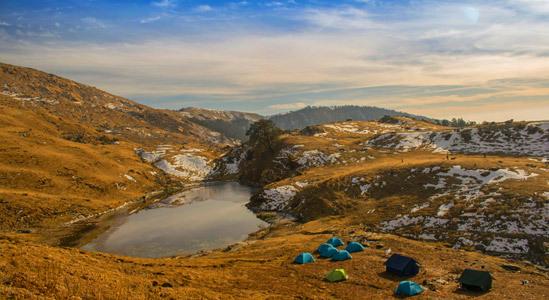 Trekking towards Brahmatal will give you many sights which you won’t be able to get in other such treks like the view of peaks such as Nandaghunti, Mrugathani, Trishul etc., trek through streams, conifers, hushed hamlets, beautiful valleys, etc. During winter you get an unparalleled and outstanding view of the Himalayas as the place is covered with a white shield of snow. Brahmatal has a lot of opportunities for capturing the nature’s beauty at its best! Time taken: From Kathgodam it’s a 10 hours’ drive. Start from Lohajung, a village situated at 9 hours drive from Dehradun. The first trail is cemented and by using a chaos of houses. 15 minutes with your trek, you will find a cluster of centuries old Cypress trees and shrubs. It would take four visitors to circumvent the woods! Try hugging it. 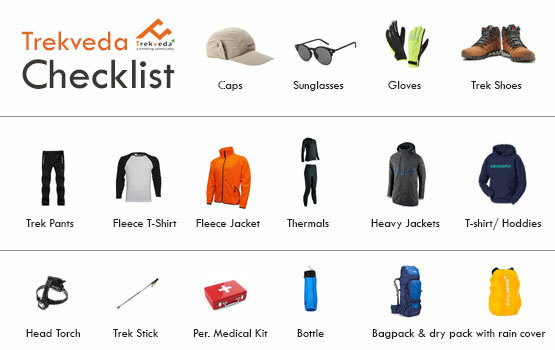 Altitude: : 7,600 ft. to 9,689 ft.
Water sources: The first point to refill your water bottles is around 3 hours into the trek, followed by another place where you can stop for rest and having lunch. The beginning of the trek is from Lohajung central market. The walk is through the upper region of Lohajung and then through the forest trail with few houses. A short trek will lead to a village spot called Mandoli. Climbing high will lead you towards Kali valley where two rivers join names kali and Pindari. Water pipes will lie along the trek that supply water to the Lohajung. Then on the left, there is a small mass of homes called Budla where you will find rhododendron trees from February to March which makes the trail more beautiful. Approximately at 8,500 ft., you will find a bridge of 10 meter known as Link-gaad to help you cross the stream. After two hours of trek, you will reach Begum which has splendid views of Navali Bugyal and Bagdi Bugyal. It a place where you can rest and take some time. An hour walk will lead you towards Gujrani stream and from there it’s just 75 minutes’ walk to reach Bekaltal. Bekaltal is a beautiful lake in the midst of the oak forests and there is adjacent lake called Khopdaliya, near which we can camp. Altitude: 9,689 ft to 10,440 ft.
Water sources: There is no water source therefore ensure to fill 2l of water before starting the trek. Meadows of Ghora Lotani, the last stop for the horses. Beyond Ghora Lotani the meadows merge in to the alpine. The starting of the trail is out of campsite and steeply climbs into the Rhododendron and Oak forest. The trail opens out to a meadow after an hour of ascent which brings you at 11,500 ft. the highest point of the day. After all the day’s trek, you will see Nainital and Almora side of the valley. There are big mountains in the area are Nanda Ghunti and Trishul. The campsite of Brahmatal 500 meters away from the lake at 10,351 ft.
Altitude: 10,440 ft. to 12,250 ft. The trek begins with 40 minute climb through the mixed forests leading out towards the open meadows and base of the big climb to the top. There is an entire panorama of open mountains as you reach to the summit. You will see Mana, Neelkanth, Nanda Ghunti, Chaukhambha, Nilgiri, Mandir, Trishul, Maitoli and high mountains stretching all the way to the Panchachuli range. Altitude: 10,440 ft. to 7,600 ft. via 10,935 ft.
Water sources: There is one spot to refill your water bottles, about 4-4.5 hours into the trek near a hamlet. The descent takes about 7 hours from Brahamatal to Lohajung. Then we go back over the route to Khabekhal, after which we directly go down to Lohajung. Then we pass by Daldum which is a wonderful location surrounded by trees. We will reach Malling after a trek of 20-30 minutes which is a water resource and outside the forest area. You will be able to see a few villages from here as well. We will reach Burali after walking for an hour which is a small settlement of few houses. Again we will find a stone trail from here leading towards Lohajung. Depart for Dehradun. Expected to reach Dehradun by 7.00 pm. The trek expense of Rs. 7,599 + 5% GST takes care of all expenses of the trek from Lohajung to Lohajung. Buffer day – It is mandatory to have this extra day as any bad weather or rain will delay your pass crossing. If buffer day is utilized, you will need to pay Rs. 1,700 + 5% GST. This amount is to be handed over to your trek leader.